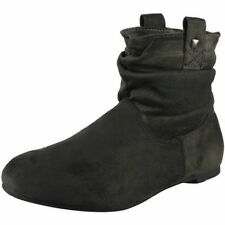 Style - Slouch Ankle Boot. Heel Type - Stiletto. Material - Faux Suede. Colour - Pink. Sole - Textile. 36 - 23 cm. Occasion - Casual, Formal, Party. Armani Jeans grey ankle boots. Fleece lined. Fold over top. "AJ" logo to inner which can be seen when worn folded over. 1" stacked heel. WOMENS ANKLE BOOTS UK SIZE 4 VERY GOOD CONDITION. Condition is Used. Dispatched with Royal Mail 2nd Class. Ladies black patent boots size 7 in great condition . Only worn for a couple of nights out. Very comfortable and often got great comments when I wore them. One heel has a tiny gouge but not noticeable when on. Please check photos, it was there when I purchased them new but did not deter me. Dispatched with Royal Mail 2nd Class. Ladies Dr Martens Red Leather Pixi Boots Gr8 For Festivals Sz 5 . Good used condition,been in the loft packed away carefully for yrs,so time to re home them along with many others that kept them company in the attic Listing daily at bargain prices to clear them all quickly. PLEASE NOTE I ONLY POST ONCE A WEEK UNLESS PRE ARRANGED WHEN I CAN IF YOU LIKE THEM,GRAB THEM UP BEFORE SOMEONE ELSE DOES,or get your max bid on. PLEASE CHECKOUT MY OTHER BITS LISTED,LISTING DAILY AS HAVE LOTS TO CLEAR INCL VINTAGE 60;s dresses and bags carefully stored for years in my attic , Thank you and good luck x Condition is Used. Dispatched with Royal Mail 1st Class. Lining- Fleece. Materials - Upper- Leather. Sole - Rubber. Size -U.K- 4. Slight worn out on the heels.See Photo. ( see the condition on the photo). Beautiful boots unworn were a gift but too big as wrong size bought. Really lovely. Grab a bargain. New Ladies knee high Boots size 4/37 by Ellashoes. Inside zip fastening. Calfs measure 15 inches. Brand new never worn. Any questions please feel free to ask. All my items are posted within two working days after payment is received. All my items are posted tracked and are from a smoke and pet free home. Any items bought on a Friday will be posted on Monday. UK bidders only please. Thanks for looking. Over the knee boots size 8. Another impulse purchase. Never worn as I can’t really walk in heels. Bought them in Australia.Dispatched with Royal Mail 2nd Class. ladies ankle boots size 5 new. Dispatched with Royal Mail 2nd Class. Leather uppers, man-made sole / heel. ladies boots size 6 chicolate brown suede. Condition is Used. Dispatched with Royal Mail 2nd Class signed for. Pull on boots. Italian made. ladies tan washed look leather boots size 6. Condition is Used. Dispatched with Royal Mail 2nd Class signed for. Casual washed tan leather style. Soft Italian leather. Here l have for sale a pair of Hotter dark tan leather slouch boots size 8. Black Vodoo Doll Boots, Size 5. In good condition.